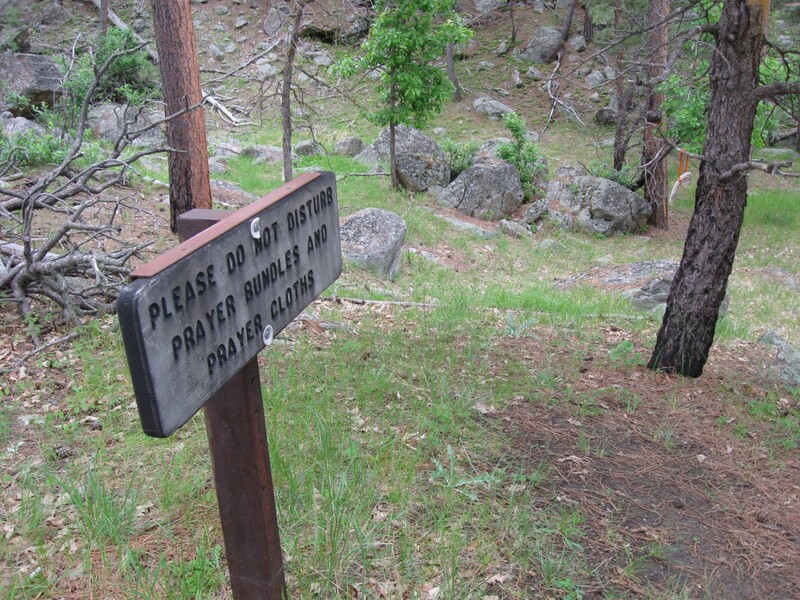 Our 2009 Road Trip, Part 16: Bedevilment at Devils Tower « Midlife Crisis Crossover! 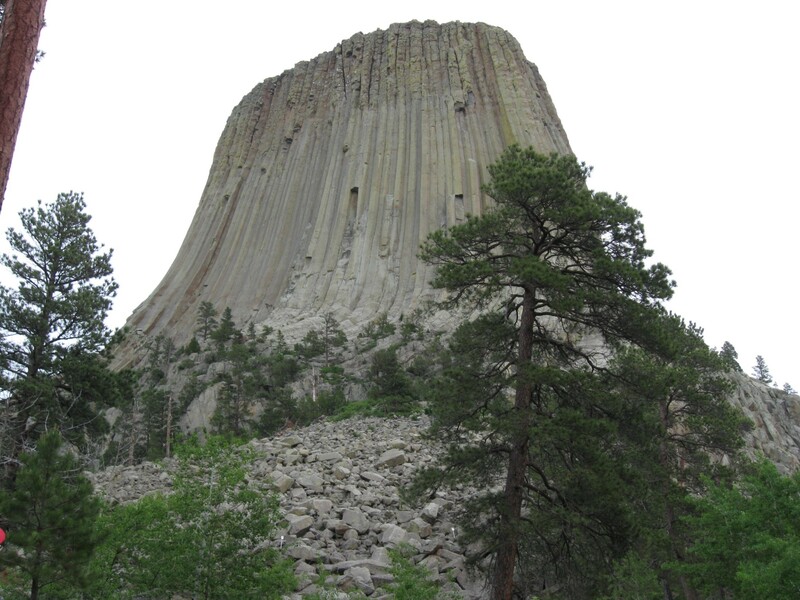 Many onlookers only know Devils Tower from that one time it worked with a young Steven Spielberg. As of this writing I’ve visited 32 of our 50 United States. Anne has seen a few more thanks to her grandma, who drove her to Maine one time back in the ’80s. We’ve had the chance to luxuriate and wander several of those at length. Some of them were one-stop wonders, states adjacent to others that weren’t a main focus in a given trip, but were easy enough to cross off our lifetime to-do list if we could think of a reason to get out of the car and say hi. Perfect example: on our 2013 drive to Boston, we visited a Connecticut museum in our path (and weren’t enamored enough of that sketchy neighborhood to explore any further), but we couldn’t find an easy way to work Rhode Island into that year’s itinerary. 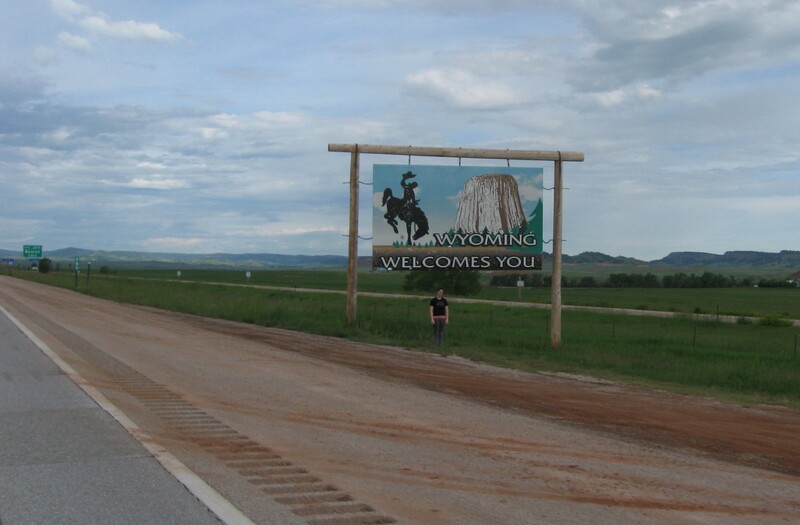 Since we were at the westernmost end of South Dakota anyway, we had wondered if we could find an excuse to hop over into its neighbor Wyoming. About two minutes of research brought us to an obvious option of inescapable prominence, by which I mean that gargantuan protuberance up there. 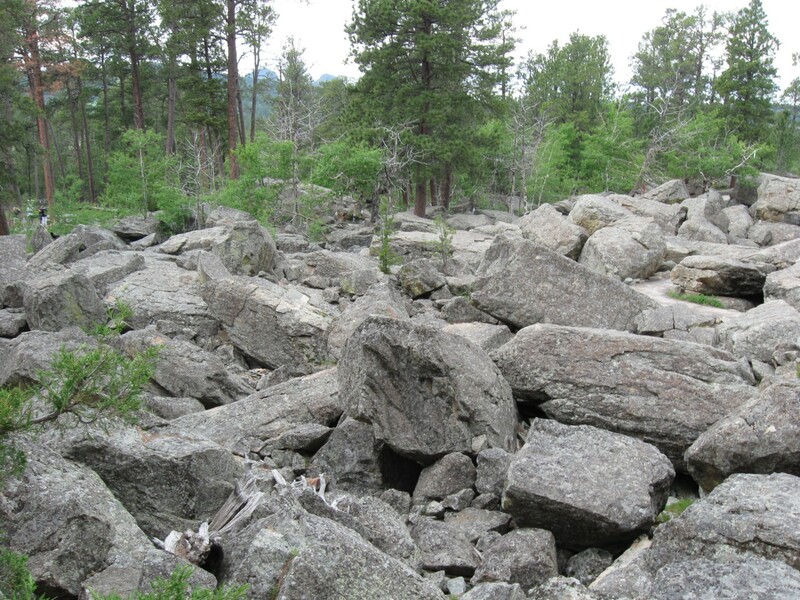 Once again, the Black Hills, now featuring mesas. DAY SIX: Wednesday, June 17th. One hotel breakfast bar later, we were on the road to Wyoming. A sign along the road advertised a gas station on the Wyoming/South Dakota border that promised the cheapest gas around. We had hoped to stop in, but the turnoff was camouflaged, cleverly disguised as mere rolling hills. I don’t remember this perfectly timed pedestrian in the shot at all. I’m assuming she was originally there and this photo hasn’t become retroactively haunted. 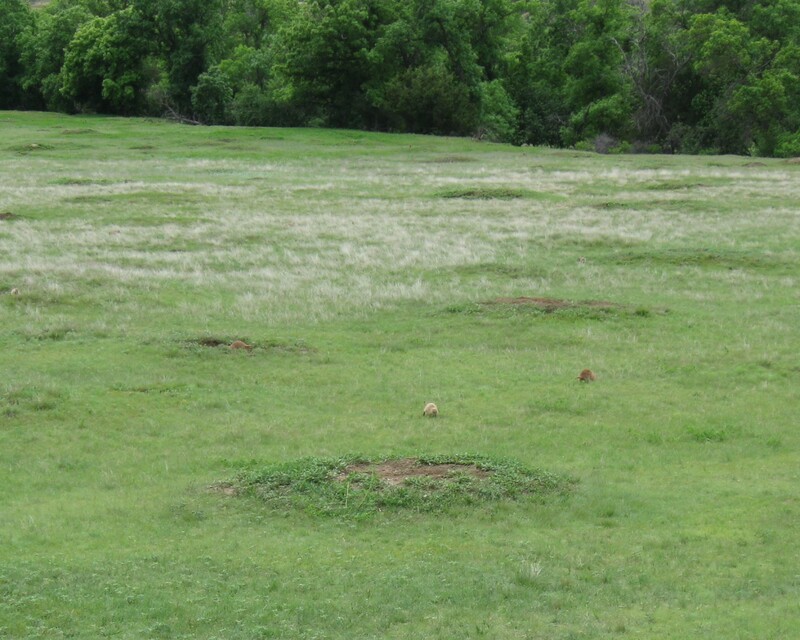 It’s the American West, so of course we saw prairie dogs on the way. 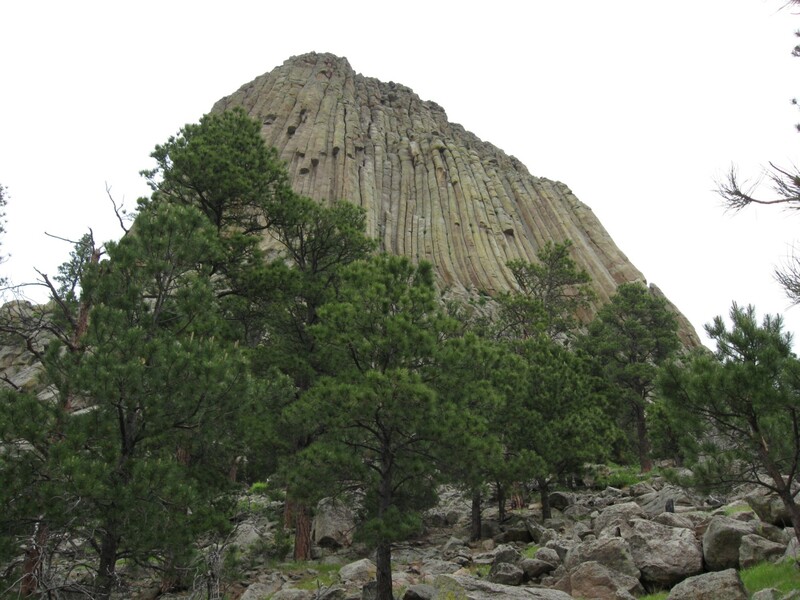 Our primary objective for the day was Devils Tower National Monument. It stands nearly a quarter of a mile tall in the middle of an empty, hilly plain with a small town or two nearby, and not much else that’s manmade. You might remember it from such films as Close Encounters of the Third Kind, where it was the setting for the climax. 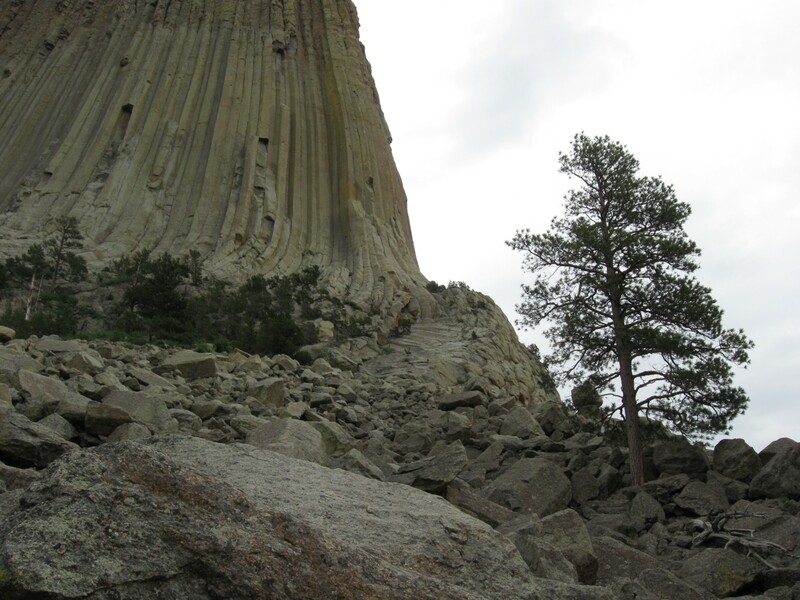 Deep in the beautiful desolation of eastern Wyoming, Devils Tower was visible from eight miles away, recognizable even without a spaceship hovering overhead. The long and winding scenic route took its sweet time in leading us in laps around the tower to the parking lot and visitors’ center. 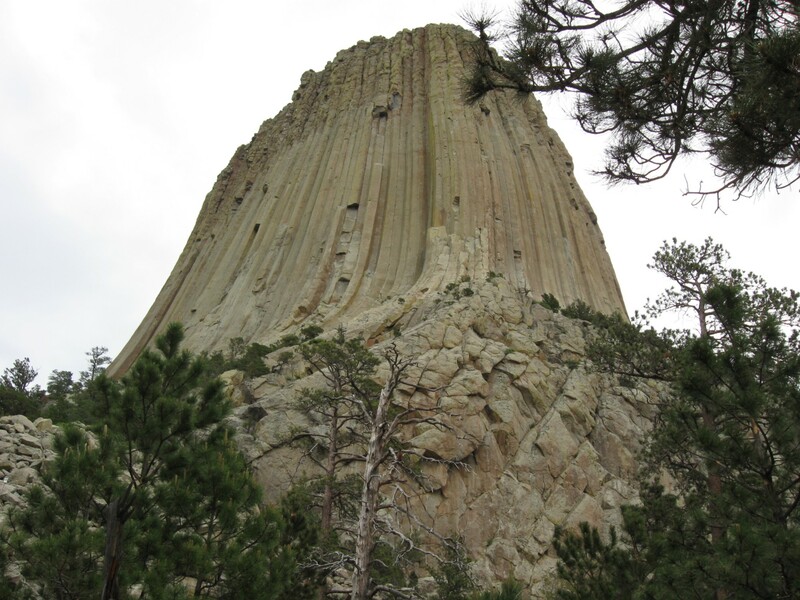 If you only know it from a single picture, you might imagine Devils Tower looks the same on all sides, but it is actually not that symmetrical. From different angles and lighting, it appears to take on different shapes. 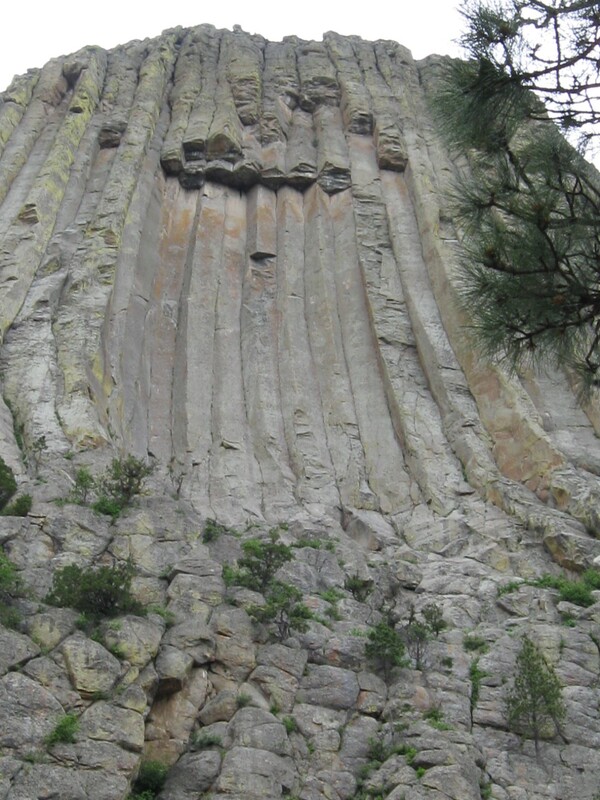 Devils Tower: a tanned side. 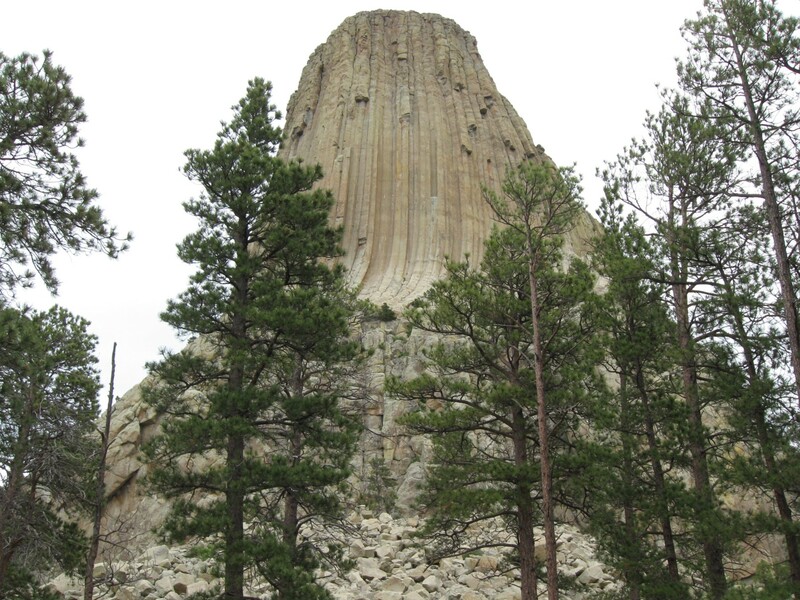 Devils Tower: an untanned side. Up close, the walking path around the base of the Tower didn’t look like such a long distance. We decided to stroll around and see the sides for ourselves — gravel on one side, huge chunks of rock on another side, trees on yet another. 27 sides later, we realized we were fools, suckered in by the Devils Tower optical illusion. 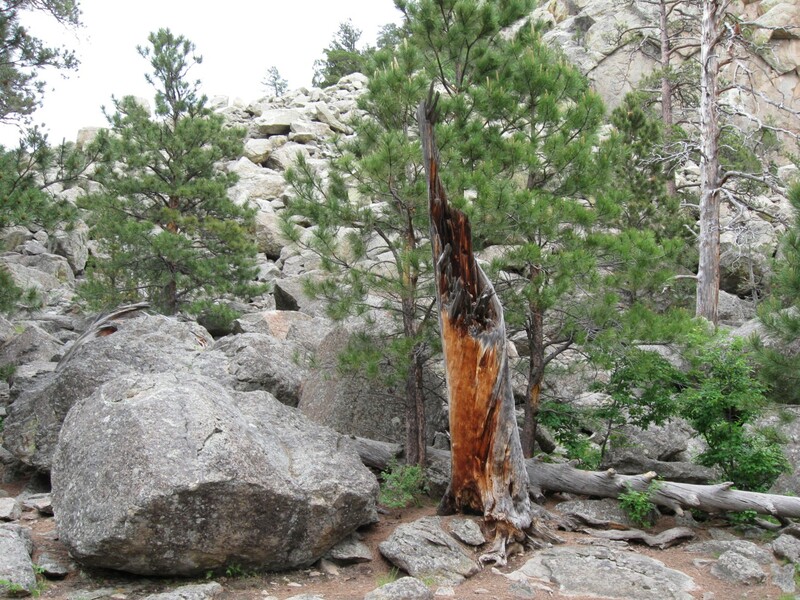 Yes, every side was different, and Devils Tower seemed to have more sides than a snowball has snowflakes. Some sides had more trees than others. Some sides reveal odd shapes if you stare at them too hard. You might look at some sides and wonder how high you could climb. Amateur ascent testing would be most unwise. 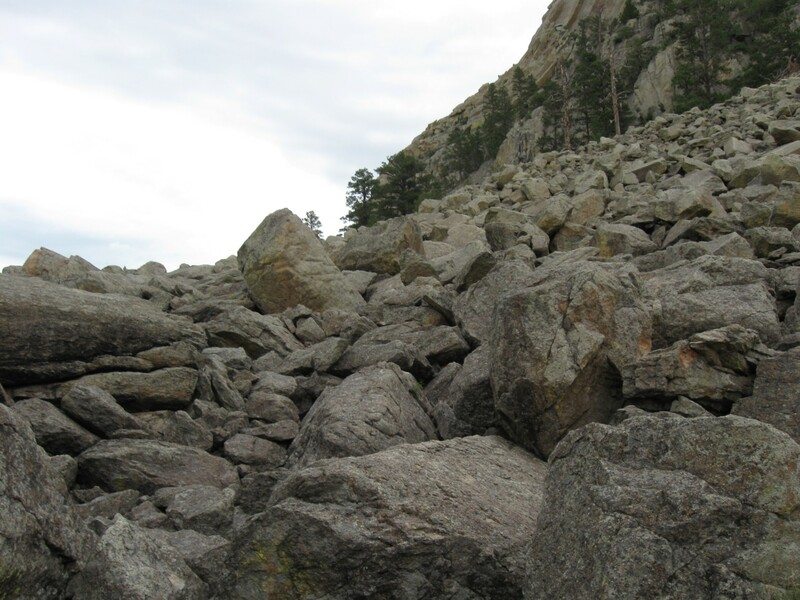 So many rocks, so much steepness. Rocks: as above us, so below us. Even farther beyond is the natural glory of Wyoming. 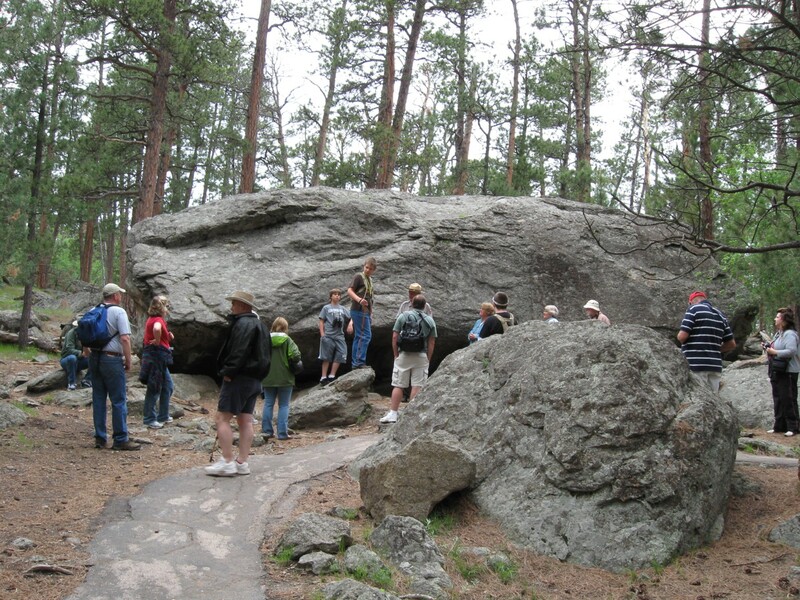 Fellow travelers stop short at some of the largest rocks within reach. A few features jutted out from the uneven landscape and implied untold stories we would never hear. 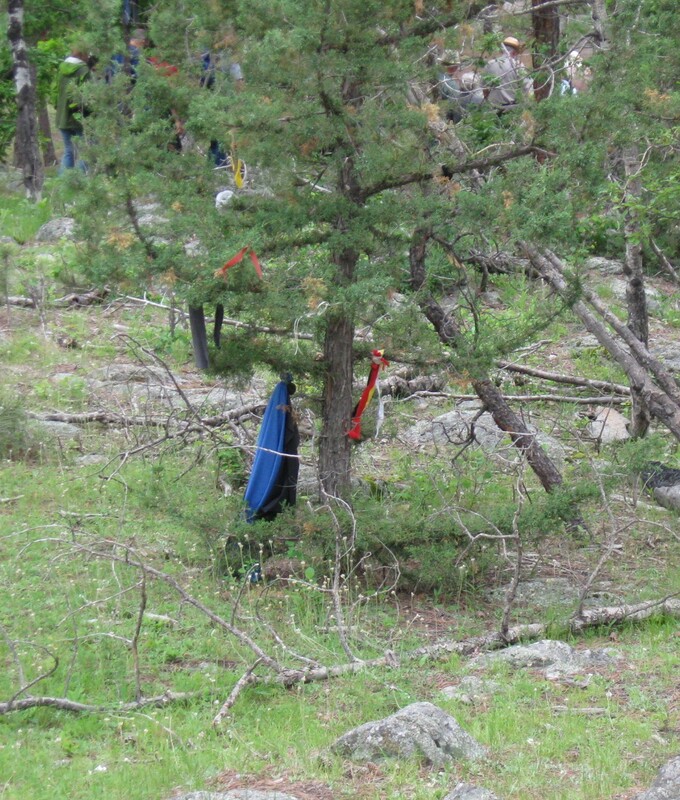 Prayer bundles hung from branches at a few points along the main path. We and all other guests proceeded without intruding upon them or peeking inside in hopes of finding snacks like unruly bears. Signs confirm these bundles are meant to be there, not abandoned or forgotten by any means. When I originally uploaded some of our vacation pics back in 2009, this particular photo became one of the most popular when a MySpace user hot-linked to it to illustrate a blog post inviting other MySpace writers to create poems about the spirit world. I guess I was flattered? 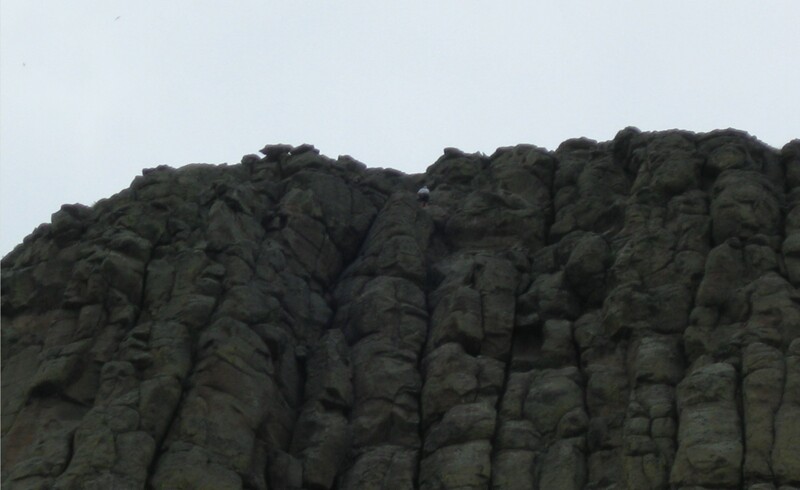 From one distant vantage point we could see and hear a group of Tower climbers a few stories from the top. 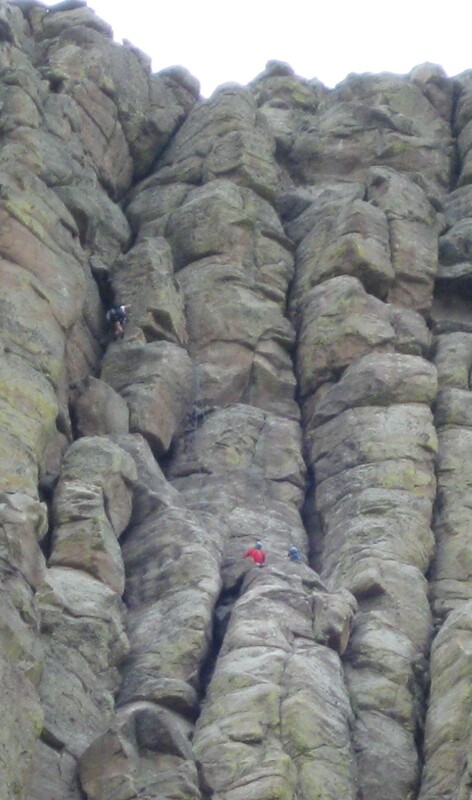 During the month of June, there was ostensibly a voluntary ban on climbing the Tower out of respect for Native American rituals conducted each year. Presumably this pair had obtained the proper permit, or had steeled themselves for the wrath of the local gods. They inched up bit by bit while shouting at each other loudly enough for the winds to carry half their conversation down to us at ground level…and that half was, “I CAN’T HEAR YOU!” The deafer of the two could have heard his partner more clearly if only he’d though to rappel to the ground alongside us. Hardier, sturdier folks than our trio. Our last sight of the winner before we got back to walking on ordinary flat ground like chumps. By the time we reached side number Omega, my son was kind of a wreck, and my wife and I weren’t feeling too hyperactive ourselves. Eventually we returned to our starting point along the path and sought refuge in the visitors’ center. Anne posing from a more welcoming area, nearer to restrooms and chairs. We paused for breath at the visitors’ center gift shop, which was small in size and selection. 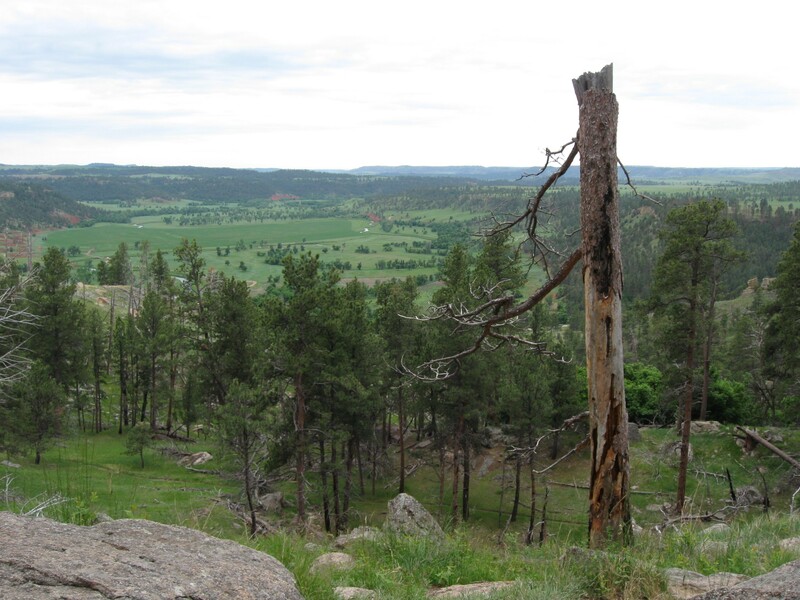 We were amused by a children’s book called What Pooped in the Black Hills? but we otherwise came away empty-handed. Anne had another plan in mind already — her pre-vacation research had indicated that the Devils Tower Trading Post at the park entrance would have a huge selection of souvenirs. Unfortunately for her, she hadn’t counted on my fixation on our dwindling gas tank, which had pushed most other thoughts out of my head. When I’m too worried about something, or too excited, or too intrigued, or too just-about-any-emotion, I develop a sort of mesmerized tunnel vision that propels me past anything within sight or hearing that’s irrelevant to my fixation. I can forget, overlook, dismiss, or misinterpret a frightening amount of seemingly obvious sensory input. I wish I could blame-shift this condition to old age, except I don’t think of myself as “old” most of the time. I wish the problem was simply one of making consciously bad choices, but more often than not it happens on autopilot. Anyway, this form of intermittent creeping brain malfunction on my part is why, when Anne asked to stop at “trading post” some undisciplined part of my mind intercepted the phrase, tweaked it, and forwarded it to the rest of my brain as “post office”. As luck would have it, there’s a post office right across the street from the trading post. How convenient! So I pulled into the post office parking lot and paused. Anne told me she didn’t need to stop at the post office. I squinted at her, shrugged, and returned to the road back to South Dakota. Several blocks later, Anne finally realized that her husband was possessed by temporary stupidity. She knew there could be only one cure: she exploded at me. Presto! Worked like a charm. I immediately — though, regrettably, with no small amount of grumpiness and stung pride — turned the car around and headed right back to the trading post, despite the several blocks’ worth of extra gas it might expend. Anne was well aware of the gas issue, so she quickly ran into the gift shop, intending to forsake any perusing and just smash some pennies in their smashed-penny machine for our niece and nephew. She assumed her husband was waiting with the engine running, so she hurried as much as one can hurry a smashed-penny machine. A few minutes later, she glared at me when I walked in the trading post, too. Having had a few minutes to clear my head and regain one or two of my senses, I realized that leaving the car running was pretty dumb under the circumstances. And since the car would be turned off anyway, why not come inside and grab myself a souvenir, too? Our odds of returning to Wyoming again within the next decade were next to nil. Carpe diem and whatnot. Anne hadn’t yet had that same opportunity to calm down. Frustrated and angry with this situation, she finished her pennies and ran out to the car, only to find that the engine was off and the car was locked. 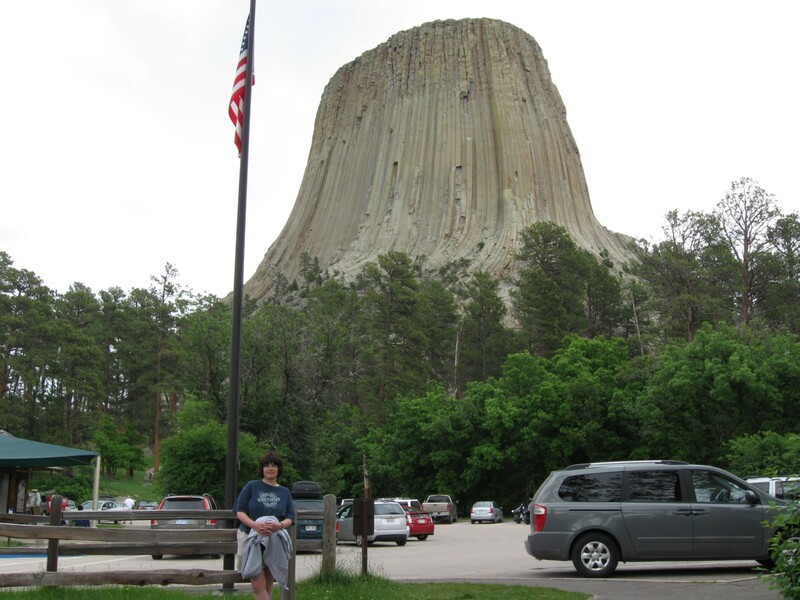 My son was inside, still recovering from the Devils Tower trail of tears. With irritation building upon irritation, she knocked on the window to have him unlock the car door. When he did, the two of them learned something our rental company hadn’t bothered to mention: our vehicle had a working car alarm. As soon he tried to pop the door, the most embarrassing klaxon in the world signaled for attention to the dozens of other tourists around us. Anne flew back inside and asked the moron for the keys, then ran back outside and turned the alarm off. She forced a sheepish grin and explained to the nearest gawkers that we hadn’t known there was an alarm on it. Then she tried to open the door again. The alarm was off, but the door was still locked. Those were two separate keychain buttons. While she fumbled with the keychain and its many options, my son tried to be helpful and unlock the door again. The most embarrassing klaxon in the world returned for an encore performance. By this time, Anne was made of rage. She reentered the post one last time to find her husband Captain Moron setting his amazing powers of leadership and intuition toward the complex task of trying to decide which Devils Tower t-shirt to buy himself. One more detonation from Anne clarified his decision-making processes and got them out the door within a few minutes. One or two more wrap-up explosions — not unlike a July 4th grand finale — begat a silent ride on a fraction of a gas tank, which was enough to traverse the next eight miles to a tiny town called Hulett. The sole gas station in town looked abandoned — no signage and one pump that dispensed only 85-octane gas. Back in Indiana the lowest level of gas purity is 87-octane. Maybe we’re spoiled or Indiana has stricter standards, but 85-octane sounded to me like a level more appropriate for lawnmowers, chainsaws, or Molotov cocktails. I take the idea of car rental seriously enough that I never think, “Oh, well, it’s not MY car anyway!” but we were hardly in a position to be choosy. I put only $5 in the tank — enough to get us comfortably within South Dakota while minimizing any imaginable internal engine damage. I’m sure 85-octane is good enough for the local Waltons. I just don’t like gambling on the unknown. And if my brain malfunctioned once more and left Anne with no choice but to take my life into her hands, I’d’ve rather we at least made it back to South Dakota first. Wow. This is awesome. Thank You.